I’m joined by psychic expert and mentalist Mark Edward and European Skeptic Podcaster (ESP) András Gábor Pintér. We are now about to start day 17 of my About Time tour; I would have thought I would be exhausted by this point, but I was still running on energy and having a great time. 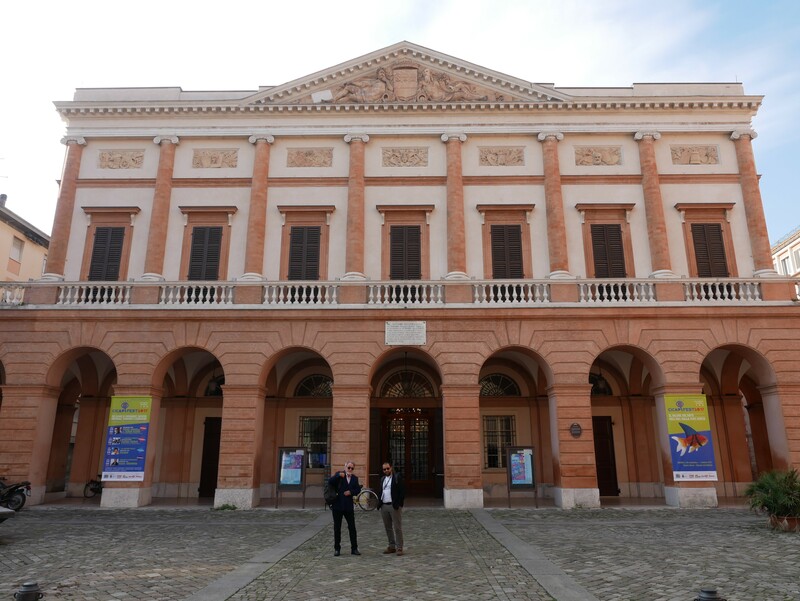 The three of us arrive in Cesena, Italy, on Friday September 29 for our first CICAP FEST. This is an Italian skeptic organization founded in 1989 by Italian science journalist Piero Angela and scientists including Luigi Garlaschelli. As it was becoming more and more obvious as I visit skeptic organizations all over the world, the influence of the American group CSICOP was being felt all over the skeptic community. CICAP, Comitato Italiano per il Controllo delle Affermazioni sulle Pseudoscienze—or in English, Italian Committee for the Investigation of Claims of the Pseudosciences—was born after Angela’s television show Indagine sulla parapsicologia (Inquiry on Parapsychology) spurred scientists to meet in Turin and formalize the group. The current president is author, Massimo Polidoro. He is also a cofounder of CICAP and along with Angela, a fellow of CSICOP. I need to make sure you all understand who Piero Angela is and how influential he is in Italy. Angela was born in 1928 in Turin, Italy, to an anti-fascist doctor. He studied literature and became an amateur jazz pianist, he became a reporter on the state radio in 1952, and when television was introduced, he was part of the only news broadcasting team in Italy. He became known for his science reporting, directing science documentaries on subjects about space, biology, economy, parapsychology, and more. He is a well-spoken, sympathetic, non-controversial man who is loved throughout Italy. I spoke to many people at the CICAP FEST conference about the allure of Angela. On Friday, the conference was open to the public for free, and Angela was the draw. Lines were long with fans waiting to get his autograph, take a photo, and meet him. It was explained to me that when television came to Italy, his face was one of the first people remember seeing; all of Italy grew up with him, hearing his voice and learning about science from him. Attendees explained to me that teenagers had tears in their eyes when they met him at the conference. Over 800 people attended Friday, most to see his lecture. I’ve been trying to find a way to explain to Americans just how popular he is. Imagine Carl Sagan, Bill Nye, and Walter Cronkite rolled into one person, whom you have watched on television for sixty-five years (he does still appear on TV) and maybe that will explain the fascination the Italians have with him. He is a champion of science and scientific skepticism. When I asked CICAP staff and conference attendees what would be the state of pseudoscience in Italy without Angela, they said that it would be difficult to imagine any kind of organized skepticism existing, and the country would be overrun with nonsense. Okay, now that I’ve explained who Piero Angela is, let me explain what this conference was all about. 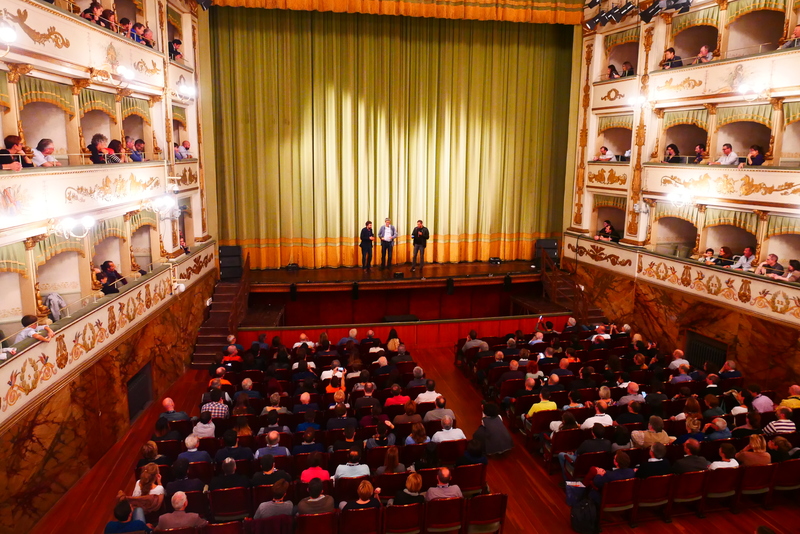 The venue was the amazing, jaw-dropping beautiful Teatro Bonci, which is an opera house built in 1843. The town of Cesena located in Northern Italy has a population of under 100,000 people. Parking is not abundant, but everything is within walking distance; shops and restaurants are all over the city. The hotel we stayed at kept its reservations on paper. It’s a very quaint town with lovely friendly people. CICAP had two conference buildings to accommodate the over 800 attendees. One held 200 people, the Palazzio del Ridotto, and was used for workshops and smaller lectures. CICAP publishes the skeptic magazine Query: La Sciencza Indaga I Mysteri as well as many books. Sadly, I had no room for book purchases in my luggage, plus everything was in Italian. I did purchase one thin book by one of my favorite people, Ray Hyman, The Art of Cold-Reading. Randi wrote the forward and while there I got him to autograph it, and then later at CSICon I got Ray to sign it for me. One man I met the first hour I was there was Francesco Grasssi, who had written a comprehensive book on crop circles. The book has amazing photographs of crop circles, most he created himself. http://www.francescograssi.com/ András interviewed him talking about his book Crop Circles: Signs of Intelligence on the ESPodcast. The conference was completely in Italian, but many people spoke English, and everyone went out of their way to make us feel comfortable. James Randi and myself were the only non-Italian speakers. I was on a panel on Sunday morning called “Debunking and Fact-Checking: Servono Oppure No?” They wired me with an earpiece and assigned me a translator to tell me everything that was being said in one ear, and I answered in English. It was hilarious; I hit it off instantly with my “babel fish,” Veronica Padovani. I tried to keep up with the panel discussion and questions asked of me, but as I was always a few seconds behind the conversation I had to take matters into my own hands. I only was able to speak four times, so each time I got a chance I didn’t completely answer the question asked, but made clear that I was at the conference to find people I could train to become Italian GSoW editors. András filmed the panel so hopefully I made my point. After leaving the stage I waited in the lobby with GSoW editor Raffaella Vitali to see what would happen. We were overrun with people asking questions about GSoW. It was terrific, and gained new Italian editors who are now in training. Hopefully more will follow. One exhibit set up off to one side was devoted to optical illusions. Magician Carlo Faggi was the host of this exhibit, and I filmed a nice video of him explaining everything to us. As you can probably imagine, there was a lot of food involved in this conference. They treated us really well, and I was shocked to find that I didn’t gain weight on this tour. One really special thing happened at CICAP FEST was that a couple blocks away from our venue, Pope Francis came to speak in town. It was the 300th anniversary of the birth of Pias the VI, who was born in Cesena. This was an almost surprise visit; the CICAP organizers were not aware it would be happening until shortly before it happened. The Pope was scheduled to speak until 10 a.m. and my panel started at 10 a.m., so I saved him a seat just in case he showed up. Sadly, he didn’t. The Pope helicopter took him to another venue where he spoke to another crowd in a nearby city. I filmed a bit of this experience and you can see it here. On the Sunday morning of the Pope event, we had to walk a long way through crowds and security to get to our venue. András was wearing a Press Badge; at one point he was stopped by security and asked why he was walking away from the Pope event. András explained that he was attending another conference and reporting on that. The security were really confused why anyone would not want to report on the Pope. Mark, András, and I got to spend quality time with the organizers and Randi. András interviewed people—which you can hear on the ESPodcast—and I asked a lot of questions about the CICAP organization, the successes and difficulties concerning pseudoscience in Italy, and how they managed to get 800 people to show up for a conference in a small northern Italian town. What I learned was that CICAP is highly organized, especially because many volunteers participate. As CICAP FEST is every two years, they can spend more time promoting. They had a lot of focus on magic, with performers, workshops, and presentations by Carol Faggi, Max Vellucci, Gianfranco Preverino, Pino Rolle, Francesco Busani, Marco Aimone, Alex Rusconi, and of course James Randi. They also had popular TV personalities that dropped in besides Piero Angela. 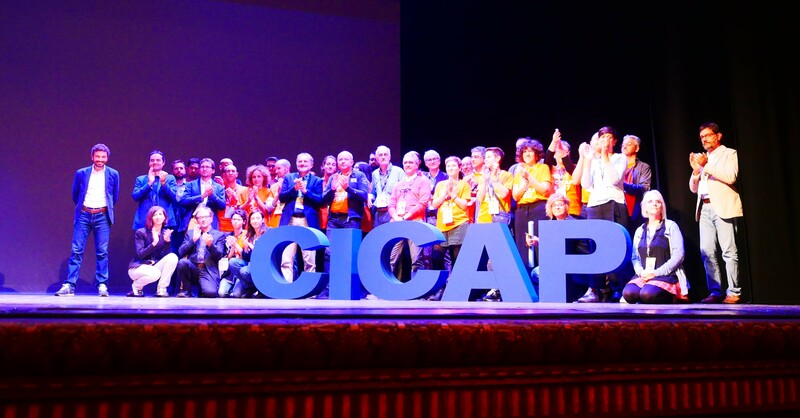 The Executive Director of CICAP is Massimo Polidoro who is a draw all by himself. He has appeared on TV a lot in Italy as well as internationally. He is a podcaster, journalist, and popular writer. His latest books are Segreti e tesori del Vaticano. Un viaggio straordinario nell’unico Stato Patrimonio dell’Umanità – Secrets and treasures of the Vatican. An extraordinary journey in the only World Heritage Site and L’avventura del Colosseo The Adventure of the Colosseum. So having all that star power, experienced organizers, plus only having the conference every two years really helps boost the attendance numbers. I know it is a cliché, but I found it to be true. Italians are really relaxed. Nothing seemed to phase them, not even having the streets completely closed for parking all around the venue on Sunday, and having big screens with the Pope speaking right outside the entrance to the conference. They may have been stressed, but I could not see it; whatever happened, they just found a way around it. Nothing seemed a big deal, and everything seemed to run smoothly. Speaking to the volunteers afterward, they told me they were getting very little sleep and were exhausted, but they never showed it and went out of their way to find English speakers to talk to Mark and I and make sure we were having a great time. András speaks many languages and did a lot of translating for us around town. He said he barely speaks Italian, but he did just fine. My next article will be as we leave Italy and head for Slovenia and Hungary.